In beginning this Series a particular person hadn’t really become clear to me as to who this one would be in need of it – for there has always been a focus person, situation or circumstance in developing each one. Little did I realize that a mirror would be needed for this one – for on this day I’ve lost a Good Man, the highest honor given a man in the Bible. With this Series it has come full around to reminding me of this song as I’ve lost a DEAR Friend, Mentor and Encourager. Two men this week have gone on to Glory, leaving behind a rich legacy of both Christian Faith and Service. Both of these men leave behind spouses of character, honesty and virtue – who no doubt know that they were adored by their husbands. We focus on these things because they are what we have right here and right now – we can touch, help, move and protect those things, as we should do for certain. My focus for a few moments will be on what they so clearly wanted others to be looking forward to after this life is gone away. 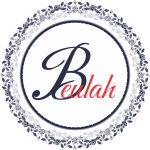 What Are You Looking For in Beulah? 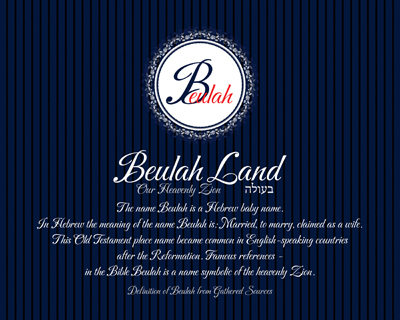 Beulah can mean different things, places to many people – but we need the real sense of it, the Bride of Christ. 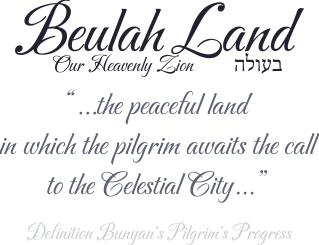 Beulah Land is referring to God’s Heaven, which is the beginning of Eternity at the Marriage Supper of the Lamb. So the question could be posed this way… Who will you be expecting and have assurance of being there in Heaven when we are gathered as Christ’s Bride called to the largest gathering of any and all peoples who have Trusted Him? Do we truly expect to see our loved ones who have Trusted upon the Lord Jesus and have gone on before us? Do we Believe it? Of all those that you know, care for and work around – how many of them know you and I are Christians? Do they see Beulah in our lives? It is not a scavenger hunt mindset, it is a daily living proof of the Holy Spirit resident in us that should be seen in each and every thing we do. We want others to see Heaven in and through us – just as these two men I speak of doing in their lives. One will not be able to find anything in Beulah that doesn’t belong there, nor will there be any person there that , save those that the Lord Jesus Christ has allowed in His Wisdom, that has not accepted Him as Saviour, King and Lord. The two Good Men that I speak of, are there because of God’s Provision of a Saviour and each of them accepting Jesus as their own person Saviour. There are nine (9) passages of Scripture used in this Series which give snippets of things we as Christians should be looking toward and Praising our Lord for the providing of for our sake. No matter what time of the year it is, losing someone close to you – whether that be a family member or a person who has become like family to you – can be difficult to accept even under the most understanding circumstances. Knowing that loved one is Born Again, having accepted Jesus Christ as their Saviour, is the single MOST important live choice item there is – for it is a matter of Eternal destination. The influences that others have on our lives can be more profound than we may realize until we do not have that person in a place to make those influences however they may be involved in our lives. From one incredible couple’s absolute youthful fancies for surprise to another caring couple’s profound reach into our family life, Beulah Land got a little easier to sing and a WHOLE lot SWEETER. Are you and I being that someone to another person, couple or family? From Alabama, North Carolina & New York – two families made a difference in our lives, because two Good Christian Men were willing to share, invest and care for others outside of their immediate family into not only my life, but my wife and daughters as well. Use, in this instance, is more clearly indicated as a sociology point – DO NOT TUNE ME OUT – this just might be why so many folks are missing this. What people of Faith once would have shunned or “never” have done, Christians today are doing in reckless abandon – in part because they refuse to listen or consider their actions, how they will affect others and the detriment it will cause in their own lives because they have done so. How many times have you or I seen someone do something that we just knew would put them on the wrong track, then watch that action play out in utter destruction in their lives? How many of them just “wrecked” their own lives, not affecting anyone else? If we will be honest, with ourselves and our Heavenly Father, not much that we see happen only affects just that person – it has the potential to tear down, rip apart, decimate and destroy untold lives with just “one person” making a decision to do it their own way. Parents who blindly consider their children are safe with video games to keep them out of trouble – then purchase them violent, theft, life taking, fighting and killing oriented games which are increasingly lifelike and are matched only by Rated R, NC-17 movies in their terror, vulgarity and lawlessness. How many would say they have flipped a “tipping point” in their family, house, neighborhood, street… Gangs, robbery, lack of respect for the law and overrun jails, prisons and death row wards have their victims because of it. Friends who want to have a good time – don’t we all want to have FUN – decide to take the coming of age individual out for a drink, am not talking about a soda pop here. They proceed to live it up – this person they are celebrating has never been around alcohol or the consumption of it and has only the “made for TV” concept, not realizing that NOTHING like that really happens. After having their “good time”, this person gets behind the wheel of a vehicle and recalls nothing of what came next in the lives of a family he/she didn’t even know. How many would say this person AND those that aided in creating the situation had a “tipping point” in their lives in the hours, days and weeks following when that person kills with a vehicle – not recalling anything. I know – my Sister Rexanna was killed by a drunk driver, head on collision – it was his FIRST drinking time, she saw him coming, screamed for her family to get out of the truck – 100MPH+ collision – our family was changed forever. Very few people realize that when a critical decision is made, which is just tossed off as minor, lives can hang in the balance of that decision. We could also see a major decision be a tipping point in a positive manner. A Mom or Dad making a decision for Christ, where the entire household Trust Christ, being born again because a parent bowed themselves down, possibly in desperation or humility, willing to let go of themselves in order to get a hold of the Holy Spirit. The keeper of the prison in Acts 16 is a clear demonstration of this type of tipping point in the life of a family. The young Hebrew boys made such a decision – it changed the course of time and has provided us with a Christophany to gain understanding of our Heavenly Father’s ability to come to where we are and that nothing is too hard for Him. How many of our decisions are made with such firm and resolute declaration? Actually, ALL of them should be made that way. We have to develop that Trust in Him. These eight (8) passages direct us in who that “we serve”, how God promises to “deliver us”, letting us know who we should “not serve”, who to “not worship and how we can clearly set things before that state “be it known” the Master we are to Serve. This Series can be a little hard to swallow. It was through much digging, researching and soul searching, with a SIGNIFICANT amount of prayer, that each point could be developed through completion. There are decisions made at every place where we find ourselves. Some of those decisions appear to be simple, straightforward and level headed, while others have a complexity to them that we as humans have such little understanding of the ramifications that they will bring. One thing is for certain though, just as those three Hebrew boys knew, God is ABLE and can do ANYTHING He DECIDES to do. Each action that comes to pass is to Honor, Bless and provide Recognition of Him – we must live in such a manner that our lives do the exact same thing. 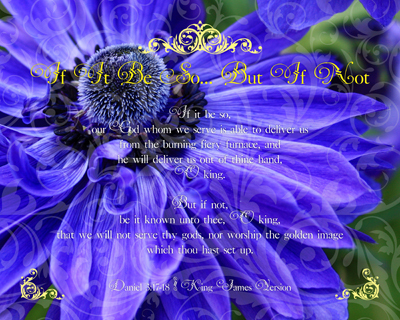 Today have we considered that we are to serve, honor and praise Him – no matter what comes our way? 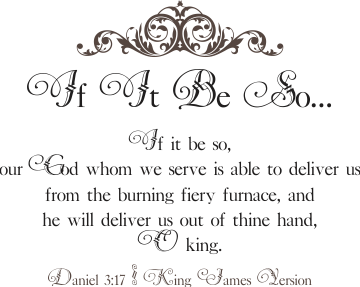 Will we, even when we don’t get the answer we want from a dire situation, or even a lessor important one, decide to Serve Him as He makes us able? What impossibility in our lives, or in the lives of others, will we say “If it be so… But if not…” with full expectation the Lord God Almighty will be Worshiped as the Great I Am?